Ethel Lina White: underrated GA writer? I am often alerted to a book I might enjoy by my good blogfriend, Moira, over at Clothesinbooks.com and that was the case with Ethel Lina White’s Fear Stalks the Village. You can see her review here: http://bit.ly/1JrsBCs. As I happened I already had a ‘box set’ of White’s novels on my e-reader and this gave me the impetus to start reading them. 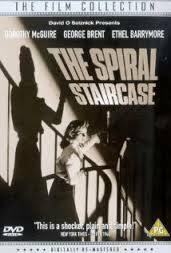 I began with Fear Stalks the Village, went on to The Spiral Staircase, Wax, and The Wheel Turns (the basis for that marvellous Hitchcock film, The Lady Vanishes). I was on holiday so had more reading time than usual and I just gulped them down. I had been put off this kind of novel by Julian Symons in Bloody Murder where he disparages the Had I But Known school of crime-writing. It is true that there is rather too much ‘little did they know’ in these novels and I could have done with less authorial comment on the vagaries of fate. But still, I couldn’t stop reading. The atmosphere and the build-up of suspense in these novels is masterly and I liked the plucky young women, struggling to earn their livings. The books are rattling good reads and as the trap closed in on the hapless heroine, they kept me reading when I ought to have been doing other things. There can be no greater tribute to a writer of suspense. If you want somewhere to start, I suggest The Spiral Staircase or Wax, which has a stupendous climax in a waxwork museum. The picture above refers to the 1946 film based on White’s novel. 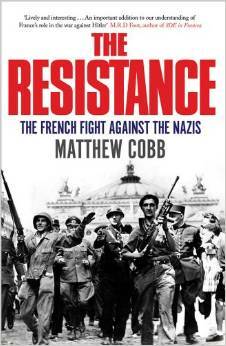 Matthew Cobb’s book, The Resistance: The French Fight against the Nazis (2009) seemed a good choice of reading for my French holiday. Although I read some of it with tears in my eyes, I was glad I had taken it. I had known, of course, that the French had suffered during the Occupation, but I hadn’t known how much. I hadn’t known about Service du Travail Obligatoire through which young French men were conscripted to work for the Nazi war effort in Germany. It was an idea that back-fired, as many young men escaped by taking to the hills and joining the Resistance. I hadn’t appreciated the scale of German reprisals: when the military commander of Nantes was killed by the Resistance, forty-eight hostages were executed including Guy Moquet, the 17 year old son of a Communist deputy, followed by another fifty. The Resistance was never a unified movement and the history of the shifting enmities and allegiances between different groups and their political affiliations was at times hard to follow. It is the stories of individual daring, of hair’s-breath escapes, of RAF Lysanders taking off from French fields on moonlit nights that stay in the memory. Women as well as men behaved with great courage: Lucie Aubrac spirited a group of resistants from a guarded hospital by posing as a nurse. Andrée de Jongh ran an escape line across the Pyrenees; when she was arrested the Nazi refused to believe that a woman could be the organiser. They sent her to Ravensbrück all the same. She was one of the lucky few to survive. Their numbers were never great, but the Resistance made a significant contribution to the Allied war effort, for instance in supplying information that led the destruction of German submarine pens at Saint-Nazaire, and destroying lines of communication after the Normandy landing. After we got home, we watched for the second time Melville’s extraordinary film about the Resistance, Army of Shadows, starring the sublime Lino Ventura. I got back from my holiday in France to find a treat waiting for me: a copy of The Starlings & Other Stories, edited by Ann Cleeves. A while ago I wrote about writing short stories to a brief and mentioned this anthology, to be published by Graffeg, an excellent small Welsh Press: http://bit.ly/1WGllMk. The stories are all inspired by David Wilson’s atmospheric black and white photographs of Pembrokeshire. I loved writing the story and it was something of a departure for me: for the first time I’ve drawn on my academic specialism, Arthurian legend in the visual arts. There are sites in Wales that have been contenders for Arthur’s court, for the lake where Arthur received Excalibur, and for the last battle. I wanted to draw on that potent myth and bring it into the present day and I hope I’ve succeeded with my story, ‘Weeping Queens.’ Reading the other stories, I was fascinated to see that I wasn’t the only one to be inspired by Wales’s rich mythological past. There are some great stories here, and it’s a beautifully produced book, too, with David Wilson’s extraordinary photographs as a bonus. 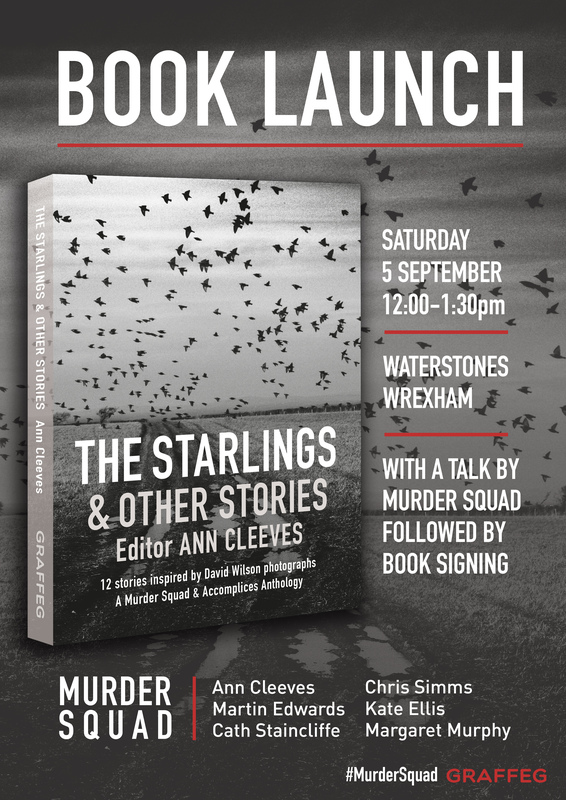 We are having a book launch at Waterstones in Wrexham on Saturday 5th September from 12.00-1.30. Do come if you can. 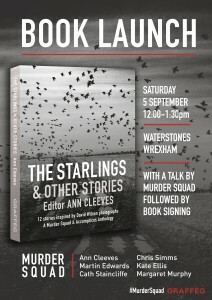 For more about the book and the publisher go to https://www.graffeg.com/product/the-starlings-and-other-stories/. If you pre-order you can save £5!